We are told that “the eyes are the windows of the soul”. If that is true, how can you make use of this fact to improve your meditation practice? Here is where the techniques of Trataka meditation come in. In this article, I explore the relationship between the eyes and the brain from a scientific perspective, and then describe trataka and other gazing meditation techniques to achieve stillness of mind through the use of your eyes. If years ago I knew about the importance of this practice, my meditation would have progressed faster. Out of the main five senses, sight is arguably the most powerful. In order to perceive through touch or taste, we need to be in contact with the object. In order to perceive a smell or sound, we need to be near the source of that smell or sound. However, with our eyes we can perceive objects and landscapes miles away, without actually being there. Indeed, 80% of all sensory data we process comes through our vision (source). But what does all of this has to do with the mind and meditation? The relationship between eyes and the brain starts in your first days of fetal life. Your eyes start to develop just two weeks after conception, with the retina and the optic nerve developing as a direct outgrowth of your brain. So the retina is actually a piece of the brain that has grown into the eye, and also share a similar structure (1, 2). On top of that, sight is so important that almost half of the brain is dedicated to vision and seeing. Conventional medicine knows that mental health conditions translate into specific eye movement patterns (source). That is why people with good emotional intelligence are able to read your mental state through your eyes. Indeed, there has been much research literature suggesting that mental conditions involving attention (such as ADHD, dyslexia and anxiety) are accompanied by and increases inerratic eye movements. The same is true regarding your breathing—it changes according to the emotion or mental state you are experiencing in every moment. There is a specific breathing pattern that sets in when we are angry, for example; and another when we are fearful, depressed, tired, happy, etc. The contribution of Eastern philosophy and the“consciousness experimentation” of the Yogis is that the opposite is also true: your eyes and breathing patterns also directly influence your mental and emotional state. This is really good news, because it is much easier to work on the level of the breathing and eyeballs, than it is on the level of the mind (which is so subtle and volatile). Next time you feel anxious, angry, or stressed, observe how is the movement of your breath, and of your eyes. Then consciously bring a sense of relaxation and stillness to them both, and you will notice that the emotional state changes as well. If you can focus your eyes, you can focus your mind. Learn how. Interestingly, in the past few decades Western Psychology is developing theories and methodologies based on the same principle. One of them is EMDR (Eye Movement Desensitization and Reprocessing), which is a therapeutic modality for treating trauma, started in 1987 by psychologist Francine Shapiro. In a research done by the National Institute of Mental Health, EMDR was found to be substantially more efficacious than Prozac for PTSD. It is now recognized as an effective treatment by the World Health Organization (WHO), and is one of the treatments for PTSD sanctioned by the Department of Veterans Affairs. Conclusion: Your vision is tightly connected to your mind. Your mental/emotional states affect your eye movements. You can also affect your mind, and even manage trauma, by doing certain practices with your eyes. Our eyes are constantly making microscopic jerking movements called microsaccades, designed to make sure that the image of anything falling onto the retina is constantly changing (this is called Troxler’s Phenomenon). They do this so that the objects in our field of vision keep being registered by the brain; otherwise, by constantly staring at an object for long enough, it tends to disappear from our perception. In fact, our eyes can focus on multiple things every second. This restless scan of the environment, much like our fight or flight response, was a necessity when living in the jungle. In our modern lifestyle, however, our inability to turn off this anxiety producing pattern does not contribute to our survival or quality of life. Yet, the intensive use of computer and smartphones is training us to be ever more restless with our eyes. This is one of the reasons why our attention span keeps getting shorter. Conversely, what the meditators of yore found is that by stilling these micro movements of the eyes, stillness of mind could be induced. Let’s run a quick experiment. Look for a few seconds at the two images below. You’ll notice that in the first one, the wheels appear to be moving; while the second one seems to have blinking black dots. Now look at them again, but instead focus your eyes on one of the dots in the image, and be attentively vigilant that your eyes don’t move even a bit. If you manage to do that, the movements will disappear, and you will see the images for what they are. The second image will probably be more challenging. Stilling the eyes is not the only way to achieve stillness of mind, but it is a powerful way, and the feedback is much quicker. Schools of Yoga, Zen, and Tibetan Buddhism have developed techniques based on this principle. Interestingly, research from neuropsychologist Marcel Kinsbourne shows that there is a definite relationship between eye position and the dominant hemisphere of your brain; so much so that changing the eye position can directly affect your mood and experience of the world. In his experiments, pictures appearing on the left side of our viewing field, and sounds in the left ear (both transmitted to the right brain), are perceived less agreeable than when they are presented to the other side. This is relevant because most of the techniques below involve holding a central gaze. This can explain the experience of many practitioners regarding tratak meditation and similar techniques: that there is an integration and unification of the whole brain. If looking right activates the left hemisphere, and looking left activates the right hemisphere, then it’s not unreasonable to conclude that holding a perfectly centered and forward gaze produces a balanced brain activity in both hemispheres. I have personally done extensive research on trataka, and it is currently my favorite support practice (even though I’m more auditory than visual). It is a very rich technique, so here I can only summarize its main elements. The first level of the practice is external gazing. The object can be almost anything, though the most popular choices are a candle flame, a black dot in a white wall, or an image with particular significance for you. Other objects used are your image in a mirror (your right eye), a transparent glass, a needle, a current of water, the moon in the sky, or the first minutes of the rising sun. Some Yogis express concern that unbroken practice with a candle, for more than two months, may cause a permanent impression on the retina. So if you practice with a candle, and practice it every day, take a couple of weeks of break from the practice every two months. Or swap to another object. Place the object at eye level on a little table or support ahead of you, in a way that it’s level with your eyes. As to the distance from you, some teachers recommend an arm’s length distance (this works for me), while others recommend up to 5 feet away. Experiment and see what makes most sense. Other two traditional practices of external trataka, and which don’t involve any object, are gazing at the tip of your nose (nasikagra drishti) or gazing at the space between the eyebrows (shambhavi mudra). The former induces calmeness and centeredness; the latter, alertness and expansion. To practice nose tip gazing, bring your extended forefinger about one palms-length away from your nose, and in level with it. Gaze at the tip of your finger for some moments until you are comfortable with it. Then slowly start bringing the finger closer to the tip of your nose, while holding it with your gaze. Stop along the way if needed, so your eyes get used to it. When your finger touches the nose, drop your finger, and just keep gazing at the nose. Do this for no more than 10-15 minutes in the first few weeks. To practice eyebrow center gazing, follow a similar procedure, with the difference that the tip of your finger should be level with your eyebrows. These two techniques can also be practiced with closed eyes. It causes less strain on the eyes, but it’s harder to keep the focus. Both these practices are very powerful at making the mind quiet and centered. But remember to approach these practices slowly and with patience. Otherwise, you might experience a headache. With time, your concentration and visualization abilities increase, and you progress to practicing internal gazing exclusively. Here, you are either looking at a mental image of your object, or simply visualizing a dot of light on your“mind screen” (the black space in front of your closed eyes). You can also practice internal trataka with an external scene as a prop. Center your gaze on a central point in your visual field, and observe the whole scenery around you. Then close your eyes and try to recreate the same scene within. Keep your awareness in the eyebrow center and let the image build up for you, just as it did when you looked at it externally. After mastering internal gazing, you can proceed to gazing into the void. Even thought you could do this from the start, it is advised to first master external trataka. Otherwise, your mind won’t have the stability needed to make the best use of theses practices, and you will likely get often lost in distraction or lethargy. Boochari Mudra —> raise your hand in front of your face, and gaze at the tip of your finger for a couple of minutes. Then remove your hand, but keep gazing at that same spot. You are now gazing at space, or emptiness. Be aware of space only, and don’t register any other events.When the focus dissipates, raise the hand and start again. 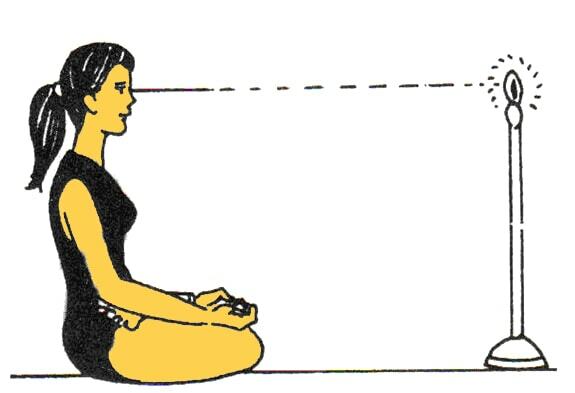 Space—> select two objects in your visual field, and focus on the space between them. After some time, close your eyes and focus on the space between your thoughts. Evening Sky—> also a Tibetan practice called Sky Gazing (see description below). Darkness—> in a lightless room, gaze at a spot in the darkness in front of you. (Warning: do not try this practice if you have suppressed emotions or were exposed to traumatic experiences, as they are likely to surface powerfully through this exercise). The Seer—> with your eyes closed, turn your gaze 180 degrees around to yourself, the source of all seeing. Gaze at the“I”, the observer, the perceiving consciousness. This is indeed, a type of Self-Enquiry meditation, although almost everyone attempts it without undergoing the previous training of external and internal trataka. Luckily us, the gold is out! ? In the ladder of Yoga, trataka is often considered the bridge between the body-oriented practices – like postures (asanas) and breathing exercises (pranayama) – and the mind oriented practices of meditation (dhyana) and the superconscious state (samadhi). It is also an essential preparation for all visualization-type meditations. Recommend books on the subject of Trataka are Asana Pranayama Mudra Bandha and Dharana Darshan (the latter is one is the most comprehensive expositionI’ve found so far). These two treatises, and other Bihar Yoga books, were the bulk of my study on trataka. We’ll now explore other trataka practices from different traditions. Dzogchen, a tradition in TibetanBuddhism, recommends the practice of sky gazing. Find a high place with a good view of an expansive clear sky. (You can also lie on your back outside and try it). Sit comfortably and for a few moments calm your mind with long deep slow breaths. With a good posture, tilt your head slightly upward and with a noble disposition gaze without distraction or dullness into the clear expansive blue sky (best done on non-cloudy days). Let go of all thoughts, allowing them to pass by like clouds, and encourage your awareness to slowly merge with the expansive blue sky. Notice how inner thoughts evaporate into your inner sky-like awareness like clouds evaporating in the sky. Recognize that this open and expansive experience is actually the most fundamental and natural state of your being. Sustain this recognition of an open and expansive state of being for as long as possible, and return to it when you get distracted. Unlike the Yogic practices of trataka, which emphasizes concentration, the practice above emphasizes resting in a natural state of mind (which the clear blue sky represents). The method of Dzogchen gazing disorientates the conceptual mind. It’s very important to practice the gaze first. You have to do that in order to keep your eyes from seeking forms upon which they tend to settle. In terms of Dzogchen, we train through the senses and the sense-fields rather than through trying to let go of thought. We learn to fix the senses. We keep the senses unmoving in relation to the external world. You would sit by the sea. Or you would sit by a river. You would focus on the surface detail of the water, so that you saw it very clearly and crisply. You would then fix your gaze. You would achieve that by keeping your eyes from moving. The eye muscles habitually track movements by flicking backwards and forwards along the line of movement.You become aware of that darting movement, and you continually attempt to freeze it – to fix your gaze. This is a specific of many Dzogchen practices. The impression you would receive would be like a photograph taken at a slow shutter speed. This is one of the best ways to train in fixing the gaze. The way to train in focusing in space, in terms of Dzogchen, is to learn to feel comfortable when your eyes have no object of focus. This seems challenging at first, but it is by no means difficult. In Zazen meditation, we rest our gaze on the floor, about two to three feet ahead. Or while facing a wall we place the gaze about one-third from the bottom of the wall to your own height. We don’t gaze at the wall, but through it, to be open to peripheral vision. You are not looking at anything, and not seeing anything, but just gazing softly. The eyes are also kept immovable and half-closed, to minimize the need for blinking. Then, you bring the attention to the breath, or to the body “just sitting”. In classical Greece, the philosophers practiced navel-gazing (omphaloskepsis), as an aid to contemplation of basic principles of the cosmos and human nature. You also find the practice of gazing in the Orthodox Church, where icons of saints and personages from the Bible are the only companions that monastics take with them for long periods of retreat. In Theravada Buddhism, there is the practice of Kasina meditation, which also starts by gazing at an external object, and later progresses to focusing on the mental image of that object. The ten objects recommended by the Buddha for this are: earth, water, fire, wind, white, yellow, red, blue, space (or sky), bright light. We can see the strong similarities with the selection of trataka objects from the Yoga tradition – which shouldn’t be surprising, since the Buddha learned meditation from Yogis of his time. In Taoism, there is a flower gazing practice, where we keep a relaxed and receptive focus on a flower, and feel that we are drinking in the color, shape, scent, and healing energy of the flower (full instructions). They also have moon-gazing qigong practice. In Sufism, there is also the internal practice of“gazing at the Beloved”. In Jewish mysticism (Kaballah) there is the practice of gazing at certain geometrical forms and symbols. We usually read a lot about how to do meditation by using the sense of touch (as in breath awareness, mindfulness, and walking meditation) and the sense of hearing (mantra meditation, TM, nada yoga). In this article I have focused on techniques that use our sense of sight. Other types of meditation will use feelings (like loving-kindness and some tantric meditations), places in the body (chakra meditation, yoga nidra), or imagination. Here is the PDF version of the post, as promised. [If you are already part of my mailing list, don’t worry, only one instance of your email will be kept.No duplicate messages will ever be sent]. We have seen how the sight is the most powerful sense, and how it is a direct door to influencing our mental states. If you can spend 5 minutes in a perfect gaze, your mind will definitely experience a sense of stillness – otherwise you couldn’t have held the gaze. The moment you have even the slight memory, thought, or imagination, your eyes will have a micro-movement, and you will notice that straight away. When I tried these meditations for the first time, I disliked them immediately. But a year later, when I tried them again with a better understanding of their value, I began to really enjoy them. My main meditation practice improved a lot after seriously engaging in trataka as a support practice. That is what motivated me to write this piece. Have you tried any similar practice? If so, please share your experiences.